Life is Feudal • View topic - Feedback for Suggestion on Free Cities. Feedback for Suggestion on Free Cities. I have been thinking for that for a while now. Mostly because I actually wanted to Play like this when the Game was announced. But thanks to the Mechanics it never really worked that way. This is not the Actual Suggestion and the Suggestion itself is not Finished. This Topic Serves for Feedback and will result in an Actual Suggestion being Made. This Suggestion is Aimed at Green Servers Right now. It might get a Red Server derivation. But for now its only meant for Green Servers. So as for the Idea. I would like to Suggest a new Type of Monument. This Monument would be a Free City Monument. The Claims and the Rights as well as the Requirements and Effects will be somewhat Special. A Guild only Requires 5 Members to Found a Free City. And a Free City will NOT Involve a Clan in Politics. A Guild that Constructs a Free City Monument cannot Construct a Guild Monument. A Guild that Constructs a Free City Monument will go from a Band/Order to being a City State. A City State will have 5 Ranks. And People can Join the Lowest Rank without an Invite at any given Time. Meaning that any Player happening to Walk about the Area can become a Peasant by Joining without Asking anyone. This City State Monuments Claim would be Different from a Guild Monument. First it would have a 10 Tiles Capitol Claim Radius. It would have a City Claim of 15 Tiles. And a Lands Claim of another 20 Tiles. It can be Upgraded only once to a City State Monument. Which would have a 50 Tiles Realm Claim. Unlike Guild Monuments it will NOT have an Influence Radius. The Capitol Claim is Reserved for the City Guard or Higher Members of the Guild. And only People which have that Rank or are Granted Personal Rights are Allowed to do anything there or even Enter it based on what Permissions they get. Similar to how a Town Claim for a Guild works right now. The City Claim will be Open to all Citizens and above to use. However Citizens cannot Move or Destroy Objects and cannot Build anything there. They cannot Terraform either. They can however Use and Repair any Facilities as well as Open Containers and use or take whatever they find inside them. The Governor can Set Object Rights to allow use by Peasants. Peasants can Enter the City Claim but cannot use anything unless the Object Rights are set to allow them to by the Governor. The Governor however can only Set the Rights between Peasant and Citizen use. Aside from that he cannot restrict the Object Rights beyond that. What the Governor can do. Is to Set Citizen Monuments. Citizen Monuments are Plots of Land whose Size are Set by Governor. They will work like a Personal Monument can their Size can be Set by the Governor like it was his Personal Monument. These Plots of Land can then be Given to a Peasant. Which will make the Peasant a Citizen. The Plot of Land will then work like it was this Citizens Personal Claim. After assigned to a Peasant and the Peasant becoming a Citizen. The Governor can no longer Change the Size of the Claim and has no more Rights on the Claim. The Governor can only Change the Claim Owner if the Citizen currently owning it. Has not Logged in for more than 3 Weeks or if he Decides to Evict the Citizen from the City which will have a Timer of 2 Weeks and come with a Hefty Alignment Penalty. The Land Claim will be where the Peasants Life. Anyone of Peasant Status or Higher has the Rights to use things in this Claim however he cannot Terraform and cannot Build or Destroy Buildings. The Governor cannot set any Extra Rights on this Claim. Applying as a Peasant and the Different Rights and Roles of City Members. A Peasant will be able to Build a Personal Claim in the Land Claim of the City State. This Personal Claim will have the exactly same Rights and Costs as it has anywhere else. However it will be Limited to 30 Tiles. It will Override the Rights for other except the Governor. Which can Kick the Peasant out of the City State with a waiting Period of 1 Week and an Alignment Penalty for the Governor. A Citizen is anyone who has Received a Plot of Land in the City Claim to Build his things on. Be that a House or anything else. A Citizen Monument only Servers to Designate a Territory for that Citizen inside the City Claim. It cannot be Bigger than 30 Tiles and does not Cost any Maintenance as the Land is already Paid for by the City Monument. The Citizen can still keep his Personal Claim in the Land Claim of the City. The City Guard and higher are Ranks Set by the Governor directly. This System would Allow for the Creation of actual Player Cities in the Game. The Capitol would be where the Original Members are as the Rulers of the Free City. The City being a Common Place where People can have Facilities available to everyone or only to Citizens. The Land Claim being available to Everyone for Farming Crops and Planting Trees etc. It would Allow for Players to Play together which dont actually know each other. And thus work a little bit like an NPC City in other MMOs. Just that the Guys Building and Ruling the City will be Players. The Idea is Unrefined and not Ready for Suggestion. As such feel Free to Add Suggestions or post Critics. Re: Feedback for Suggestion on Free Cities. I am really struggling to see the point of these City Claims. How would other guilds interact with them? Could they go to war with these City Claims? Or is it just a safe-haven that cant be attacked? What you have described is basically just a claim that only needs 5 players, but will "accept" new players as peasants. Which is it? because these comments say two different things. If its the first, then its really know different than current as you would have to wait for permissions to use land. (Aside from the automatic peasant status) what you are talking about, in terms of rights/permissions can pretty much be achieved within the current mechanics. I'm not 100% sure if you can already but you might be able to allow "Everyone" to access certain buildings/chests etc and enable "Everyone" to be able to erect a monument on your land. If they don't have that, maybe they should allow that flexibility. However, the below can not possibly happen in this game. It would break it and you would be playing alone with three other people. A city state could work in LIF:YO, in in the MMO. I know you want this world to be 100% safe for some strange reason, maybe you have had bad experiences with 1-2 grieving players. But all I see is a biggest exploit in the history of LiF that players would use to grief there enemies. They would make these "City Claims" surrounding there enemies and build walls and block access. They could probably do a lot worse! The only City State should should exist is the current one in server 25. There are so many holes in this post. I know you said its not finished but its not even covering half of what it should. You should really copy what you have already to a word spreadsheet and post once you have finished. As you keep banging on about, the "details are important". SonofKitt wrote: I am really struggling to see the point of these City Claims. The Point is to Create actual Player Cities. Right now and with the Current System you will NEVER get any Form of City. Currently the Rights on a Claim are a Must Set. And there is no way to set Default Rights properly because otherwise everyone can just take stuff from your Claim. Thats why currently only Trusted Members will get Rights making it impossible for it to become a City because no Clan will ever allow Strangers to actually use and Open stuff. Currently Private Claims on Guild Territory lose all Protection during JH. So it simply makes no Sense to ever put your Claim into a Guilds Territory. Assuming you do have Rights in that Claim its still better to make the PC outside. Because you get the Rights regardless and then your PC is Perfectly Safe. So nobody will ever become a Peasant on the Realm Claim of Guilds. Currently there is no way to Guarantee any Rights for a Peasant on a Guild Claim. Guild Claim Rights are entirely Decided by the Guild Leader without any Restrictions. So the Guild Leader can Grant you Rights or take away your Rights as he Pleases. This will never work with Strangers. Because nobody will ever Set up his Stuff in a Guild Place where he is not a Member and thus might just one day come Online and find his Stuff gone. Thats why without a Guarantee of Rights and a Restriction as to Changing such Rights you will never be able to get a City Working in this Game. Thats why as I said above. The Current Guild Monuments will ALWAYS be just that. A Guild Claim for Guild Members. Where others at Best have Guest Rights. But nothing more. As Described only the small Capitol Area will be set like the Town Claim. So City and Land Claim are Destructible during JH without so much as Declaring War. The Personal Claims however cannot be Touched. Land Claim and City Claim can be Attacked during JH with the Exception of the Personal Claims. The City is thus actually Less Protected than a Guild Claim. You need to Read Right. Peasants can make their Own Private Claim inside the Land Claim. This is how they become Peasants in the First Place. The Governor can Set a Private Claim in the City. If a Peasant Receives such a Claim he becomes a Citizen. These are two Different Claims. Right now you cannot allow others to Erect a Monument on your Realm Claim. And I havnt yet found out how you can allow Everyone to use your Realm Claim either. You can in Fact allow every other Guild to do so. But not Unguilded People as there seems to be no Option for that unfortunately. You can also not set a Limited Right for everyone to enter the actual City or Block a Part of the City where others should not be able to go etc. So right now this is actually Impossible with the normal Guild Claim. This is also why a New Claim Type is Required for this. Because with the way the Rights on Guild Claims work right now. No Sane Guild will ever Allow Strangers onto their Land except maybe as Guest Rights on Realm Claim. But alot of smaller Groups in Fact do not Build a Guild Monument because they Fear that others will just use it to Declare War on them. This has Improved a little after last Update. But this Security from not becoming a Target for the Bigger Guilds in the Surrounding Area would actually rather Boost than Reduce the Players in such Cities. Dont Forget these are basicly Intended to be Cities where People can Gather. Its not Intended to be a Large Clan Fortress. You guys need to Stop seeing everything only from the PvP and War Perspective. I never wanted this World 100% Safe and I never made a Single Suggestion in that Direction. In Fact such a City would be Less Safe than a Guild Claim with one Exception. Which is that the Private Claims would not Lose their Protection in this Claim. But that could always be Achieved by simply having the Private Claims outside the Guild Area to begin with. Thus it would in Fact Improve the Situation because it would give People a Reason to not Block Land away from the City Claim. I know that for some Strange Reason you want to Turn this Game into some Sort of Open World War of the Roses. Turning the Sandbox Part into a Secondary thing only used for War and Fortress Building. But thats not how this Works Mate. an Open World Sandbox MMO is Supposed to be Playable for more than one Playstyle. I somehow think that you guys are Mistaking this Game for a Medieval War Simulator. Which is why your by Default always only going in the Direction of War, War and more War. Never even considering other Playstyles in your calculations. This is an Open World Sandbox Guys. PvP and Wars are Tools for the Sandbox. Not the Sandbox is a Tool for having Wars. You guys Seriously need to get that Difference Straight. I will wait till you have finished the whole scope before I comment again because as I said, its full of holes. In its current Form this suggestion is not acceptable and would break the game apart. SonofKitt wrote: I will wait till you have finished the whole scope before I comment again because as I said, its full of holes. So Your Opposing me wanting Feedback on an Idea so I can make an Suggestion on it ?? Mate Seriously Read things properly before you comment. The thing that got holes is your Reading. And here I was actually Expecting some Constructive Critics from you. Anyone else who got Toughts or Additions ? I prefer the feudal system suggestion from Kitt with personal claim idea i suggested if you plan to make some kind of city like created by players. It is way more realistic and require more player interactions with each other aswell as politic and economic ones. I dont think it is a bad idea but it is not really realistic, and is kind of apart from other guilds. How are you suppose to be defending it realisticly ? ( if you cant destroy it is a problem ) The only city allowed in the game is in server 25 but i dont even think it is really a good concept, maybe your concept should replace it. The server 25 city is suppose to be the royal city i guess that is why it is protected, i dont know ( not really clear game lore ). Right now i see your idea like a big personal claim, i mean why not but i dont really see the point. I would definitively see your free city gestion idea implemented for the city in the server 25, to make it more new player friendly ( i guess it is what the city was suppose to be in the first place ). That would be a real good thing for new players if the lvl 25 city was the game spawn point when you start and if it actually was made to help new players. One thing to note however, if you plan to make safezone in a sandbox game, ressource should not be able to be 100% safe or only a really small quantity ( enough to restart something really small in case you loose everything ). Otherwise people stock pile ressource in safe zone and it hurt the game in all its aspect ( mainly economy and warfare ). Players should be driven to live outside with other players and not inside the safe zone, the safezone should only be a backup if you lost everything and give time for new players ( without having to worry about anything ) to assess where they should try to implement themselves. Everyone should have its role / place outside of the server 25, which is not really the case atm. Hence Kitt economy system and feudal system suggestion. Last edited by Khroma on 15 Sep 2018, 20:33, edited 2 times in total. I would definitively see your free city gestion idea implemented for the city in the server 25, to make it more new player friendly ( i guess it is what the city was suppose to be in the first place if they took the time to actually work on it ). That would be a real good thing for new players if the lvl 25 city was the game spawn point when you start and if it actually was made to help new players. One thing to note however, if you plan to make safezone in a sandbox game, ressource should not be able to be 100% safe or only a really small quantity ( enough to restart something small in case you loose everything ). Otherwise people stock pile ressource in safe zone and it hurt the game in all its aspect ( mainly economy and warfare ). Guild Claims cant be Destroyed on Green Servers either. So this makes no Difference. And its actually less of a Private Claim and more of a Settlement of Private Claims. Smaller Groups already do this. They set up several PCs as a City. And this is 100% Safe on Green Servers. But thanks to the 2 tiles minimum distance it doesnt work as a cohesivve City and it cant be used by Strangers. This Idea would provide a Framework for such Cities to Work. Kitts Idea is Aimed at large Groups and unfortunately doesnt work for smaller Groups. Which is exactly the Problem. Because this Game cannot Survive if we dont stop forcing People into Large Guilds if they want to play. Said this countless times in the past. You cannot Force Players to play a Game if its not Fun to them. If you say to Play properly people need to join a Bigger Guild. Then everyone who doesnt want that will simply not Play. We need to start Implementing proper Mechanics for smaller Groups and Solo Poayers. Otherwise this Game will continue Dying slowly but surely. Right and wrong, i suggested the personnal claim idea ( in the feudal system post ) because you were right that it didnt really considered solo player / newplayer in the first place. For the economy however, if big guilds dont need to use trading this is hurting mostly small grp and solo player, like you said on another post, they are the ones that need money to buy stuff they cant create. But big guild dont need money. So they dont need trading etc ... vicious circle. Maybe i m reaching here, but from what i gather from you, you are criticising Kitt 2 post on the implementation of his ideas mainly. The examples / implementation IG of his ideas doesnt really matters, the idea itself matter if it is interesting or not. Once the idea is good enough you can try to implement it, and it should be even if it is not perfect. Players will test it, will grief over it and devs will be able to balance it to make it work. You need to make system where everyone got a place in it, not just big guild, not just small / solo player; everyone working together. Feudal system with personal claim give a purpose of it for everyone, economy if doing correctly will make money the primary ressource that everyone is reaching for. I dont think your idea is bad, i think it should be limited to city 25 maybe, but it doesnt really fix the game as a whole. It can be a good system to implement later or to create more interesting personal claim gestion when packed together. But i think right now the game need to fix its core problem before adding even more complexity layers to unfinished system. This is just my opinion, i m probably more fixating on an overall view of what the game should aim than just specific, mainly because i think this game could be a really good sandbox one, but there is core / general systems that need to be fixed / implemented first. And then the game can build upon to give even more different ways for everyone to have its place in it. Problem is as I said that there is no way to make this work. If Guilds get the Right to just Throw Out People in such an Large Area this would be the Death of the Game. But if they cant do it you end up with a way to just block other Guilds. My Suggestion has this Problem as well. I am merely circumventing the problem by Downsizing the Scale of that Area to less than 1% of what Kitts Idea would mean. Hence if someone is Evicted he needs to move at worst 50 tiles not 1000 Tiles or maybe even more if no Neighboring Guild allows Peasants. In my System if a Guild abused the system to throw out People one Guild can at worst block this Claim. In Kitts Feudal System if a Guild Decides no Peasants on my Land it might end up blocking 10% of the Entire Server Map. This does simply not work Man. Believe me I have been thinking about such an Idea for over a Year before Kitt made that Suggestion. I asked over a Year ago when the Game was still closed Beta if I could Settle on some Guilds land like that. But I simply dont see any way to make this work. It would end up an massively exploitable System for at least one side. Yes I mostly Disagree with the Implementation. But thats Importand because the Vision is different. Kitts System is far too harsh on the Ressource thing. 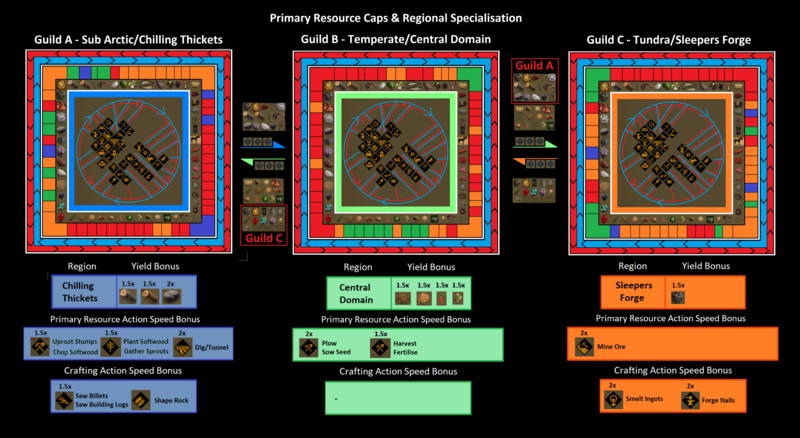 It wont get larger Guilds to Trade but will just end up with them creating an base there and getting the ressources there. Meanwhile smaller groups which cant do this will be ****** because they need to trade and dont get any to buy thus being cut off. Most Medicines are Poison if the Dosage is wrong. So this dosage is very importand. The System might work for City 25 as well. Even tough I actually hoped City 25 would become more of an King of the Hill place. Where Guilds fight for the Title of Emperor and get Taxes from the planned rentable Claims inside City 25. My System is Intendee to create small Cities. Not Fortresses and not one Mega City. A way for People to basicly get into a Group WITHOUT being forced into joining a Guild. Your opinion is not scientific proof. Half of my guild quit after they removed bark boxing. That was approximately 75 people in a few weeks. That's the same amount as the current prime-time population on Buyan. It used to be 3000. Thats 40x the population. Think about that, just one guild. If they were still here the population would be doubled. That has been the death of the game. The latest change has all but killed off any remaining members of a 150+ man guild. These were not 150+ new players, they were 150+ players who had played LiF:YO over the years and loved it and had put 1000s of hours into the game. I try convince them to come back, and most say "have they fixed barkboxing" and I say "No" and they go "Naaaaa"
These guys were not picking on the small guys, they were taking on other guilds as both attackers during raids and defenders when our guild was under attack. There was a sense of "I could be killed at any time which gave a lot of meaning to working together. You are absolutely delusional or naive if you think otherwise or that any change from now on could possible hurt the playerbase more. The only players left are the ones that will tolerate anything. I bet even you would stick arround regardless of what changes they make. Its really not. You are just not capable of comprehending the whole picture. Like you would not even need to trade if you didn't want to. And IF you wanted to trade with others, you could get them to do all the travelling. The developers have already said they plan to implement Buy Orders in the next patch. Boom you have Buy and Sell Orders. Again, these are useless without scarcity of resources, a proper transport network and accessible Trader -posts. Again, that's your opinion is not scientific proof. I am also really confused because not long ago you basically just tried to copy my post and put it in the suggestions area under your own idea. This Suggestion was Inspired by an Discussion inside an Trade Suggestion in the Forum. But the Idea was really Good. And might Improve the Game as well as Encourage Players to Trade. So I want to bring it up here. The Suggestion is to Set Effects on Crafting and Gathering depending on the Region you do it in. Thus Encourage these Regions to Trade with other Regions or Specialize in something their Region is good at. I'm cool with you posting it as it promotes the concept but i'm just confused why you are hell bent on slamming the post, then go and make your own one praising it????? Or just like taking credit for others ideas? Or just to stubborn to back down, even when deep down you know your wrong. Ha must be a tough life. If you cant see that my condolences. Problem is. More than Half of the others already Quit before that Change. See Mate if a Bankrobber Shoots everyone but a few people in a Bank. And then the Police Storms the Place and Shoots the Robbers. Then the Reason so many People died in the Bank was certainly not the Police. Your Guild by barkboxing into places where they should not have been has Killed the Game. Such People leaving will be a great thing in the long term. Your the one who doesnt see the Big Picture. All your System does is give guilds another Reason to gave Claims on other parts of the Map. Buy Orders will in fact Help the System Greatly even now. Entirely without that System of yours that would kill all smaller Groups in the Game. But this Suggestion wasnt inspired by you. And it was not Copy Pasted from you either. Hell its not even Similar to yours. It was made based on a Discussion I had with Khroma in your Topic. And included mostly a Mix of his and My Ideas. It had nothing to do with Scarcity. Unlike your Suggestion it would actually work. Sunleader for King please, make the game great again. Its not logic, its opinion. Again, these people where not griefers. We let people in our lands. We only fought other guilds and they fought us back. Like the game was original intended to be played. Again, that's your opinion. Ultimately the game has nosedived since they left so the evidence would suggest otherwise. I disagree. Currently, big guilds can do everything themselves. They don't need small guilds. They can gather all the best resources within 5-10mins of there claim. They can gather 100 wood, they can farm 100 quality crops, they can breed 100 animals. Small guilds have nothing to offer them. But if you implement scarcity, all of a sudden a small group can gather resources that big guilds in other areas of the map actually want. I don't know how you fail to see this. And relating to "your suggestion". Here are a few quote from your post. For this there would be 3 Different Effects that Regions can Apply to Crafting/Gathering Actions. 1. Bonus Effects on Materials and Items Gathered/Crafted in a Region. And which add a Permanent Advantage to these Items. Bonus Yields and Gathering Speed for different Regions. Looks a little similar to below. I.e. 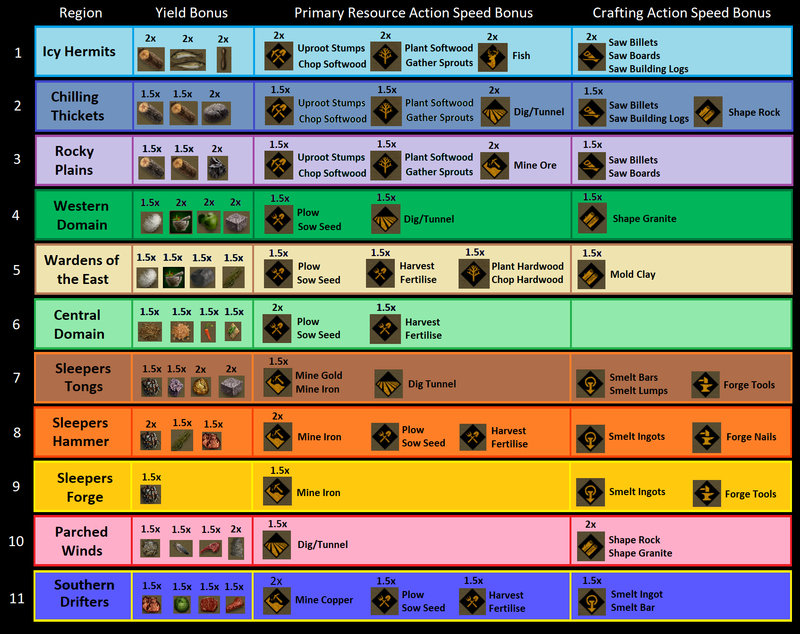 Crafting/Gathering Actions and Materials and Items Gathered/CraftedBonus Yields and Gathering Speed for different Regions. ……… I don't really need to add anything else, your words and my pictures speak a 1000 words. Quality Bonus requiring Players to have less or more Skill to Achieve a Good Quality of Items or Produce. The Central Plains thanks to the Crown advising Farmers might get Exceptional High Quality Crops which are by Default get a 20 Quality Bonus. But the Farming is not good for the Soil. Causing Herbs to have a 20 Quality Malus. The Deserts are such Experts at producing Glas so all their Glass is 20 Quality higher by Default. But their Trees are Brittle and Dry. Causing all of their Wood Items having a Quality of 10 Points less. This is literally the same concept as what I had suggested about scarcity. Where regions have a few resources that they can produce in high quality and some resources that they can only produce in low quality. Its literally the same concept but less specific. I.e. farms in the central are 20 quality better than everywhere else, while herbs are worst by 20. You sure? because the above would suggest otherwise.. I thought you were a man of logic. In regards to new players. I agree something needs to be done to retain players. And as you say, they need to re-think how new players can integrate into the worlds. I am sure the personal claims v exploits has given Bobik many a headache trying to figure out the best balance. However, currently the majority of new players are not leaving because of griefing. ALOT of potential players don't even play because of the effort required to even log in. Dispatcher issues, download issues, account issues. Those issues have turn away 1000s of players compared to griefing. I know 5 -10 people from LiF:YO who when I tried to get to join the MMO said, they tried to 2-3 days to get in and couldn't because of the above issues. Its still happening, look in launcher issues on the discord, its a busy channel. Once they have fixed these issues, hopefully with NixOS, I also think they need to implement a LFG guild/group/land system. One similar to World of Warcraft's guild recruitment could work. A new player can tick which boxes they want. I.e. "Crafter" "Roleplayer" "PvP" "I want to setup a private claim" "I want to do IBs" and guild could setup there settings "RP only" "Lancers/Archers only". That way its easier for new people to intergrate into the community. I think an ingame "Looking For guild/group/land" would help retain way more players than anything else they could do. Ultimately players don't want to join established guilds, and I agree that they shouldn't. The gameplay is much more enjoyable in a 5-20 man group. New players should be trying to group up with other new players so that they can enjoy the building/skilling/gathering phase of the game. Since you are always wrong and he is always right, your good ideas has to come up on an entierely new post made by him, otherwise you know ... it s just wrong. Simple logic of the Sunleader mind. Ha, maybe from now on I will just send the text to him to post so we don't get this back and forth waste of time conversation when we clearly want the same thing.. to suggest ideas that might help the game improve and get a more healthy player-base. You Two Ran out of Arguments faster than I tought. The Game was clearly never Intended to have actual Battles during JH. I am Sure the Game was Always Intended to have People Jump over 5m high Walls using Magic Floating Barkboxes and then Kill others inside the Walls while they werent Equipped. Sorry but try listening to yourself now and then. Nope its another Simple Piece of Logic. Getting Rid of People that cause others to Leave en masse might be losing you some People short term. But its better than having these People around and having them make you lose more and more People in the long term. If you Implemented this System of Scarcity that you Suggested. Big Guilds would still just do everything themselves. Because they have the Manpower and Ressources to just go ahead and Build an Outpost in another Region and then get Ressources there themselves. Thing is. Smaller Groups would be Killed by this. Because they cant do that and the Big Guilds will only Sell for Inflated Prices. Meaning that these Small Groups are Pushed out of the Game. Why would a Bigger Guild bother Paying Huge Amounts of Money to some Small Group when they can just have an Outpost and can get these Ressources for a Fraction of that Cost ? Mate no Offense but this is pretty Different from my Suggestion. Maybe you should actually Read my Suggestion. The Core of my Suggestion was to give Special Effects to Materials in Regions. For example by having Northern Steel have a Higher Quality Multiplier. Allowing for 70Q Iron Tolls instead of 60Q. Where is that in your Suggestion ? No the Concept is actually Insanely Different. Albeit I dont blame you. Its obvious that you dont understand this. Because this is what I complained about to your Suggestion over and over and there you didnt Understand it either. The thing is. My Suggestion is addressing the thing that I told you countless times your Suggestion Fails at. Because my Suggestion Adds a small Multiplier to the Quality of the Ressources. This means you can still get 90-100Q Stuff in all Areas. But in some Areas it will be Harder than in others. Thus making it Easier to Trade for it than to do it yourself. Your Suggestion was to effectively Kill the Quality of things in some Areas. Meaning that there you would even with Maxed Skills only get at best Mediocre Quality. Making it Impossible to actually get High Quality of certain Materials in that Area. This would mean that a Guild will become Dependent on other Areas. And as this Includes Materials which you really need alot of. It is simply Unlikely that a Guild would ever actually Buy all that. Instead they would simply Create a Claim on another Region and get it themselves. And that Difference makes the World here. But having a 20Q Malus means you still easily get 80Q or more if you can Compensate with Skills. Unlike your System where you would have like 80Q Malus thus usually getting 20-30Q Materials and maybe reach up to around 50 if you got Maxed Skills. As I explained to you in your Suggestion. The Base Idea of your Suggestion is not bad. But the Scale of your Suggestion is Simply Killing it. Trade Happens if you can small portions of what you need Cheaper that way than doing it yourself. Trade does not happen if you need to Buy 80% of the stuff you Sell because the Profit Margin just doesnt Cut it. Too much even of the best Medicine is Poison. Thats why my Suggestion Works. While yours does not. I agree that Launcher Issues as well as many other Issues are Responsible. But dont get me wrong. These People often come to Forums ask for help and will often Try again. People that are Griefed out of the Game will simply stay away and leave a Negative Review. Maybe go through the Steam Reviews. Because the Review "People just bugged into my walls to kill me" is not an uncommon sentence in the Reviews. Again your Trying to basicly Force People into Guilds. Is it really such a Hard Concept that some People dont want to Freaking Join a Damn Guild ???? I mean at least your not trying to force them into Joining a Larger Guild anymore. But still. Is it really this Hard for you guys to Understand that some People Simply DO NOT HAVE FUN JOINING A GUILD AND WILL NOT DO IT EVEN IF IT MEANS LEAVING THE GAME INSTEAD ??? Is this really not getting into your Head ???? You can make 10 other Systems to join Guilds and Groups. But guys get this into your Head. If someone wants to Join a Guild he will do that. Thing is alot of People dont want to. And you wont be making them. Either they can Play without it. Or they are gone. A Game that Requires you to be in a Guild to Play simply misses out on a Large Number of Players. And especially in Niche Genres like this. This is simply not an Option that Games can Afford. Even in WoW you dont have Systems that Force you into Joining a Guild. But instead have Systems that allow you Limited and Independent Cooperation with other Players WITHOUT Joining a Guild. I don't think there is a place or need for these independent "City States" in Life is feudal MMO. Maybe we will one day have the ability to recreate the proposed "city state" BUT only in using the current claim system with specific permissions. SonofKitt wrote: I don't think there is a place or need for these independent "City States" in Life is feudal MMO. Maybe we will one day have the ability to recreate the proposed "city state" BUT only in using the current claim system with specific permissions. My Opinion is that there is enough Place and more than just a need for it.